Director M. Night Shyamalan’s career has had many thematic undertones to it. Consistency is not one of them. After a string of early successes with The Sixth Sense, Unbreakable, and Signs, Shyamalan began a long, slow descent of diminishing returns. First there was the divisive The Village, then the ill-conceived, self-congratulating Lady in the Water, then a series of films that left critics and audiences alike baffled. The Shyamalan of old produced lean, concept-driven, thematically interesting work. In recent years, his movies had become thuddingly obvious, beholden to those trademark third-act twists that were becoming increasingly ludicrous. 2016’s Split was a welcome return to form, anchored by an incredible performance from James McAvoy as a man with dissociative identity disorder, housing 10 distinct personalities. The fact that Split was actually a back-door sequel to Unbreakable and a setup for a third film gave old-school Shyamalan fans something to be excited about. Glass, that promised third film, is now upon us. While it certainly doesn’t make good on the promise offered by Split, it isn’t as painfully bad as Shyamalan’s worst. 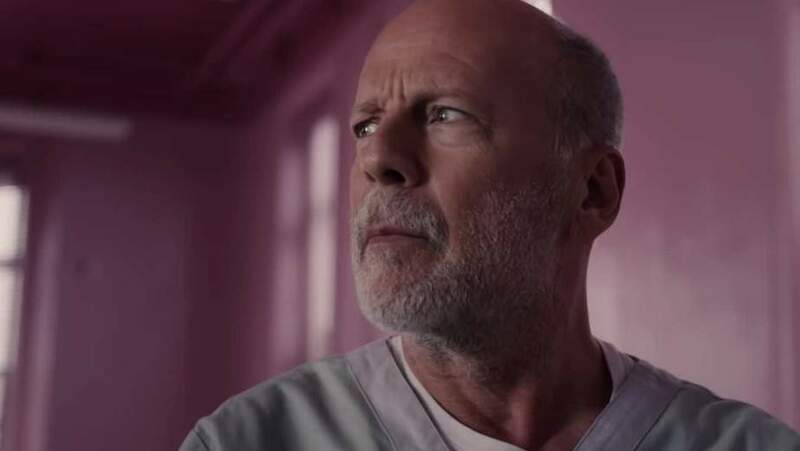 Glass is an intriguing take on superhero team-up movies, until the director gives in to his more indulgent impulses. Glass catches us up with hero David Dunn (Bruce Willis) 19 years after the events of Unbreakable. Now, he runs a home security company by day with his son Joseph (Spencer Treat Clark), and hunts bad guys by night. 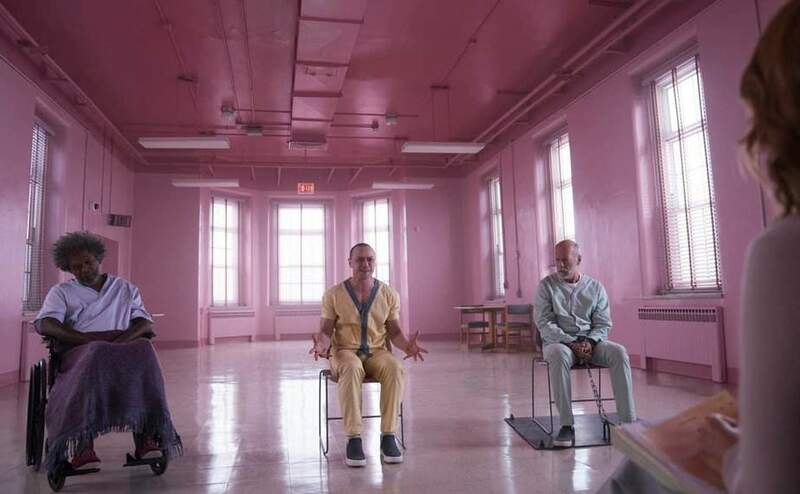 Glass opens with David trying to track down Split villain Kevin Wendell Crumb (McAvoy), who’s still at large, kidnapping innocent girls. 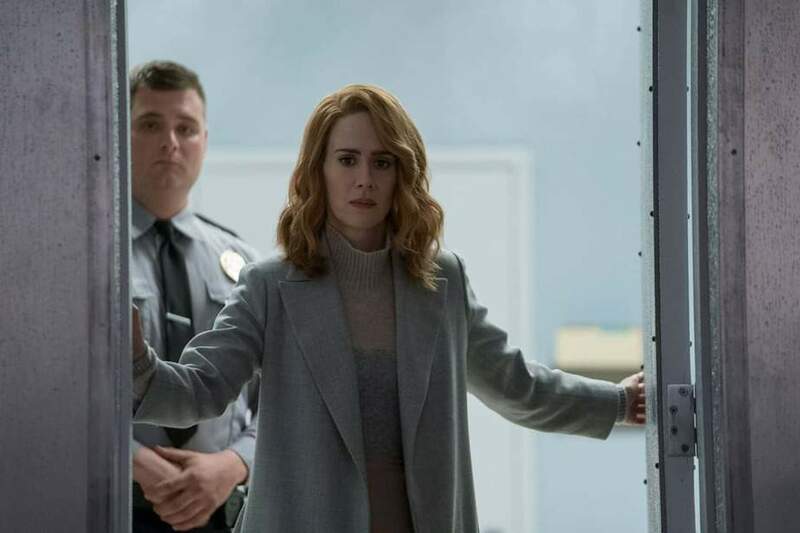 David and Kevin are both arrested and brought to a mental institution under the care of Sarah Paulson’s psychologist, Ellie Staple, who’s already treating Unbreakable’s Elijah Price (Samuel L. Jackson). Split’s kidnapping survivor, Casey (Anya Taylor-Joy) shows up to try and convince Staple that Kevin can be rehabilitated. Meanwhile, Price, determined to prove to the world the existence of superheroes, teams up with Kevin’s collection of personalities to break out of the hospital. They bait David into a battle royale with Kevin’s most violent and primal identity, The Beast. Before Glass shatters into a mess of its own making at the end of the second act, it’s a pretty tidy thriller. Shyamalan wastes no time getting us right into the action and establishes the exposition cleanly, in a way that even those who haven’t seen Unbreakable or Split in a while (or even at all) can still understand. McAvoy is still excellent as each of Crumb’s individual personalities — he’s credited with 10 roles in the film, and that’s totally justified. Each of the personalities has their own voice, body language, preferred style of dress, and even chemistry. McAvoy’s a blast to watch whenever he’s on screen. For his part, Willis also brings nice understatement to David. It’s always refreshing to see him in roles that require a subtler approach (Captain Sharp, the lonesome cop in Wes Anderson’s Moonrise Kingdom, springs to mind here), but it’s an even better surprise when that subtle approach is applied to an action-oriented character. David’s humility, sense of duty, and self-doubt all combine to form a character who has innate abilities, but needs to be convinced that those abilities are truly extraordinary. Re-introducing and setting up the characters in Glass goes well. Almost nothing else does. After everyone arrives at the mental hospital, the plot winds in lazy circles, promising advancement but refusing to deliver for what feels like ages. The film’s third act promises us a big action sequence that never materializes, followed by a series of last-minute twists. These sudden introductions try to establish a larger universe for Glass and its preceding films, but just come across as rug-pulls that stave off the movie’s actual ending. Shyamalan’s script also continues the writer and director’s confusing tendency to telegraph every major plot point and piece of backstory so broadly you could see it from space. Glass’ big fight between David and The Beast essentially becomes a giant mansplain about how comics and 3-act structure work. Jackson’s Elijah sits on the sidelines, making obvious mentions of plot developments the audience became aware of long ago. One of the film’s “big twists” is so over-explained that you’d have to be asleep not to know what was going on. What’s even more annoying is that Shyamalan’s dialogue frequently confuses terms he’s so keen on describing, such as “limited edition” and “limited run,” proving even he doesn’t really know what he’s talking about. This style — thunderingly unsubtle to the point of being juvenile — almost makes it seem like Shyamalan isn’t aware of the last 19 years of movies since the release of Unbreakable. Watching Glass is like taking a brief visit to an alternate universe. The Marvel films never happened, Batman never progressed past the 60s TV show, and comic books are still an obscure subculture (though an offhand line from Paulson slamming comic-cons proves that even in the fictional world of the film, this isn’t true). Even audience members who shy away from the current flood of superhero movies are likely already aware of the concepts being discussed here. The decision to explain them further feels not only unnecessary, but kind of insulting. Glass starts promisingly, and chugs along at a nice pace in its first act. But any suggestion that M. Night Shyamalan is experiencing a career renaissance can be put aside halfway through the movie, when his worst tendencies begin to show through. There are still some cool ideas here, and even though the ending feels contrived, some of those contrivances are good enough to keep your interest. Nevertheless, the good stuff gets buried beneath an onslaught of terrible writing.